Regardless of the relationship that you had, saying goodbye to a loved one is never easy. While support from family and friends can help to soothe this sadness, the memories never truly fade. Visiting the headstone of your loved one can be a great way to channel these memories in a healthy way, and to pay your respects. In this blog post, we’ll delve into some of the details surrounding visitation etiquette, and how to have a fulfilling visit. The time that you visit a loved one’s grave site should depend largely on the nature of your relationship. For example, if there was a particular day that was special within your relationship, then you might feel compelled to visit then. However, there are plenty of other days that are special. Memorial or Veterans Day: If your loved one served in the military, then visiting on one of these days can be sentimental. In fact, there are some military-related headstone symbols as well. 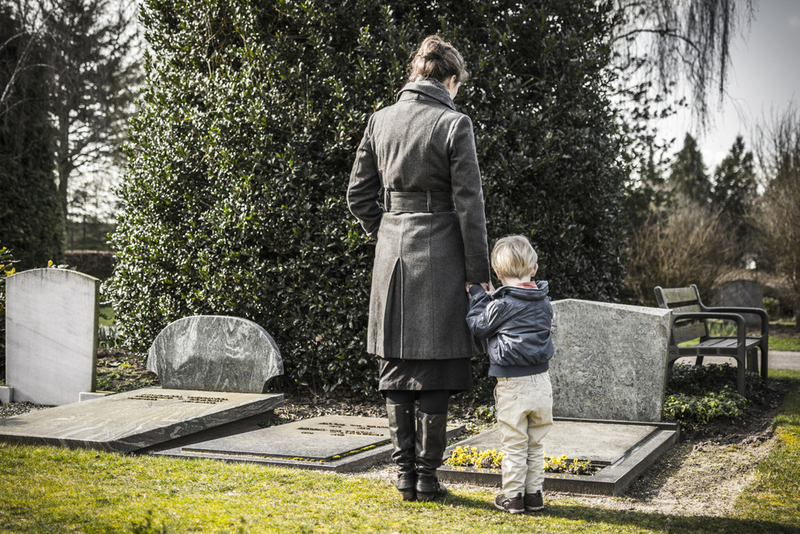 Christmas, Easter, or another religious holiday: If your deceased family member was very religious, then a holiday may be the best time to visit the headstone. You’ll also remember the joyous times you’ve spent together in the past. Wedding anniversary, birthday, or Valentine’s Day: These are all logical and fitting times to visit your loved one’s grave and headstone. A visit on one of these days will surely be a constructive way to reconnect with your loved one. Mother’s/Father’s Day: Losing a parent is difficult, but visiting their burial site on Mother or Father’s Day can help you cope with the loss. In reality, deciding when to visit is a completely independent choice. However, be sure to consider any cemetery restrictions, which may be a factor that you consider when selecting a cemetery. Over time, dirt, lichen, and other environmental factors can cause the headstone to become dirty. Weathering in general can lead the lettering to deteriorate, or worse, sink. While the cemetery staff is responsible for grounds maintenance, they are generally not responsible for taking note of poor conditions. So, if you visit your loved one’s grave site, you should check to see if it is in need of any repairs. If you find any, then be sure to request a headstone cleaning. The staff at St. Charles Monuments can easily restore any headstone to its original glory with our thorough cleaning technique. Reading scripture can be a spiritually enriching experience, especially in the company of a deceased loved one. Reading select passages that you feel capture the essence of your loved one will be rewarding. This is especially true if you know of their preferences regarding scripture. Sometimes, people prefer to visit their loved ones’ headstones independently. Other times, though, it makes sense to visit as a group. When you visit with other family members or friends, you can enjoy spirited conversations about times that have passed. This can be extremely cathartic. Even if you do not feel like conversing, sharing that moment with loved ones will be helpful. Decorating a loved one’s grave is an old tradition, and for good reason. There’s something about the sentimental value of bringing a living thing to the grave site that is restorative and refreshing. This practice is especially important for people who had strong ties to nature. 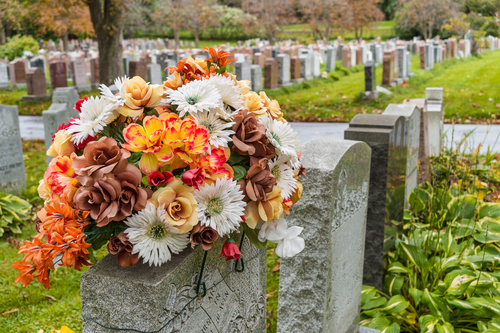 Most cemeteries ban artificial flowers, and some may dispose of plants that have died. In a similar vein to leaving flowers on a grave, leaving stones on a grave is also a common practice. This is an especially common practice for Jewish people, with the primary reason that stones last longer than flowers. In fact, this tradition has its roots in ancient practices. Leaving a picture of the deceased next to the grave demonstrates your unwavering commitment to their memory. In a way, the picture captures the memory that you have of your loved one. A family picture — whether it is a vacation, holiday, or other circumstances, can help preserve these memories. Many community organizations– such as veterans groups, boy scouts, and girl scouts– leave flags in front of headstones. And, while this public service can help you and others to remember family members, you can also feel free to leave a flag. This is especially true if they served in the military, and you visit on a significant date. At St. Charles Monuments, our goal is to create a memorial that will stand the test of time, and help you to channel positive memories. Our expert headstone craftspeople will create a visually appealing and sentimental monument. As time goes by, they can also work to restore it with expert cleaning techniques. Contact us to begin preserving your loved one’s legacy with a headstone.